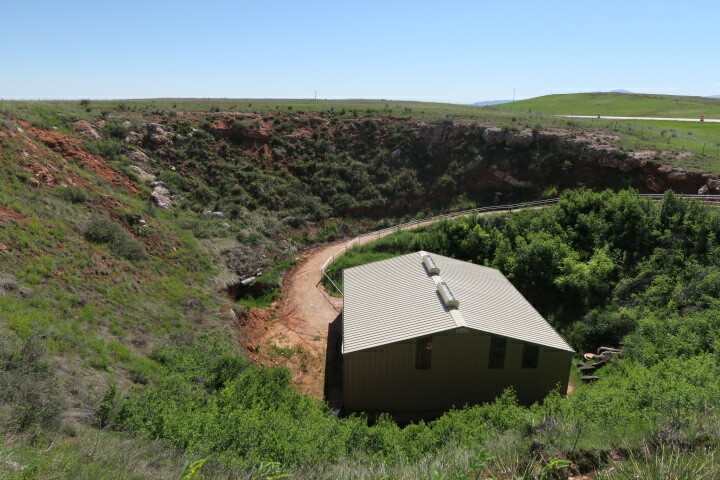 We cross into Wyoming and stop at a small dig called the Vore Buffalo Jump in Buelah. It’s a little-known attraction right off the highway. The parking lot is empty. No one else is around and the three workers inside the tiny visitor’s center greet us warmly. We pay $7 each for a tour. Our tour guide is a sixth grade math teacher on his summer break. We follow him first into a one room “museum” with nice displays on the Plains Indians. We follow him down a steep and dusty gravel path to the bottom of the sinkhole where a metal pole building has been erected over the dig. Indian tribes used this hard-to-see hole on the prairie to kill herds of buffalo. 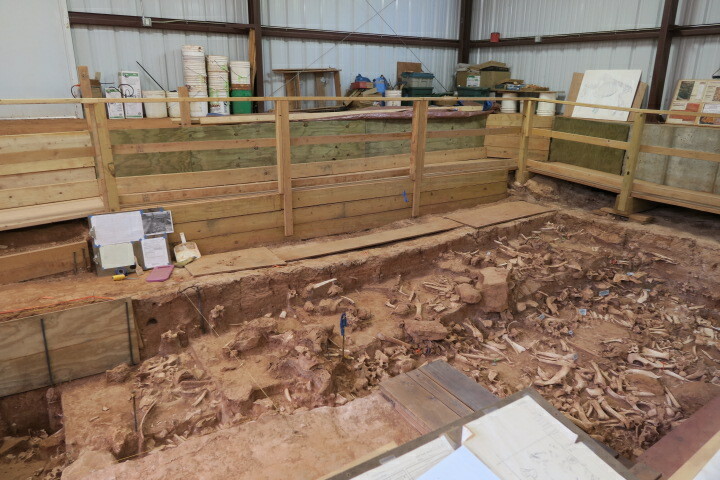 Their bones are preserved in the ground many feet deep. There is nothing to see for miles but the grassy plains and a bank of red rock to the north. It’s easy to imagine the Plains Indians gathered here, where a soft breeze always seems to be blowing and the nighttime stars glow like spattered paint against a midnight sky. It’s a vast and empty landscape that is stunningly beautiful. The sun is shining today, making colors come alive. Much of South Dakota is made of pink quartzite. Indians used it to carve pipes and early settlers cut it into blocks for walls. It’s the rock used that gives South Dakota’s highways their distinctive pink color. Many of the gravel paths we’ve seen this week have glistened in the sunlight. 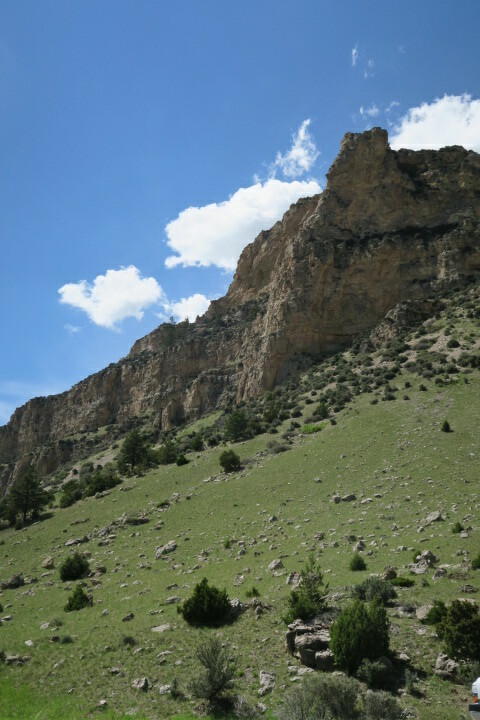 Our guide tells us that this is due to a rock called mica. We see the sparkling, flaking mica and the pink quartzite everywhere we go. Many years ago, Doc and my daughter Amy became fascinated with rocks. Everywhere we would go on our cross-country vacations, we would stop along the roadside and the two of them would collect rocks. As we rode down the highway, Amy sat in the back seat using her rock field guide to identify and label what they found. Many of the larger rocks decorate our garden today and I still have a glass cabinet filled with smaller specimens. One of the things that has been forgotten on this trip are Doc’s harmonicas. I “google” music stores and find one along our route in Gillette, Wyoming. Doc is able to buy four new harmonicas. Four new ones that he already has at home. $120. Cha-Ching. Oh well, it’s only money. We’re in Gillette, and it’s lunchtime so I pull out my restaurant list and we choose a Mexican place called “Los Compadres.” The brightly painted restaurant with its colorful tables and chairs is very crowded with what appears to be local workers – a great sign. Lunch is both good and inexpensive and the services is fast so we’re quickly back on the road. 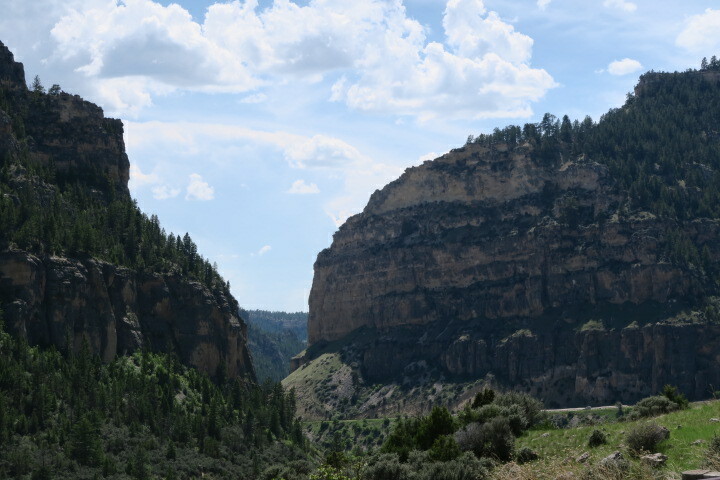 Our plan for the afternoon is to explore the Bighorn Mountains via Rt. 16. Signs before we reach the mountain road tell us that Rt. 16 “has the least grade” (if you’re a truck driver and care) and it is the “most scenic” drive over the mountains. Afterwards, I conclude that all the signs singing the praises of Rt. 16 have been erected by the town council of Buffalo who want you to use Rt. 16 so that you’ll pass through, and maybe stop and spend some cash, in their town. 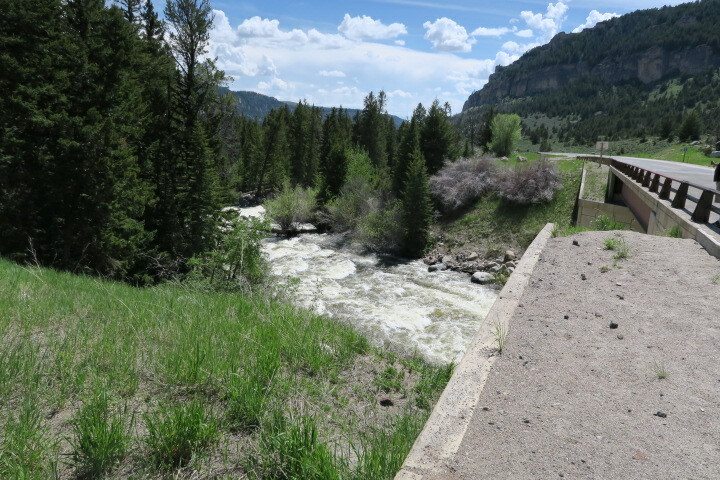 It is a nice drive to be sure and Ten Sleep Canyon on the other side of the mountains is pretty spectacular, but it is not the “most” scenic way to cross the Bighorns. At least not in my opinion. We enjoy the drive as far as Ten Sleep, a tiny little speck of a place that we visited 20 years ago, and then we turn around and drive back across the mountains to Buffalo in time for dinner. Our hotel in Buffalo is the historic Occidental. 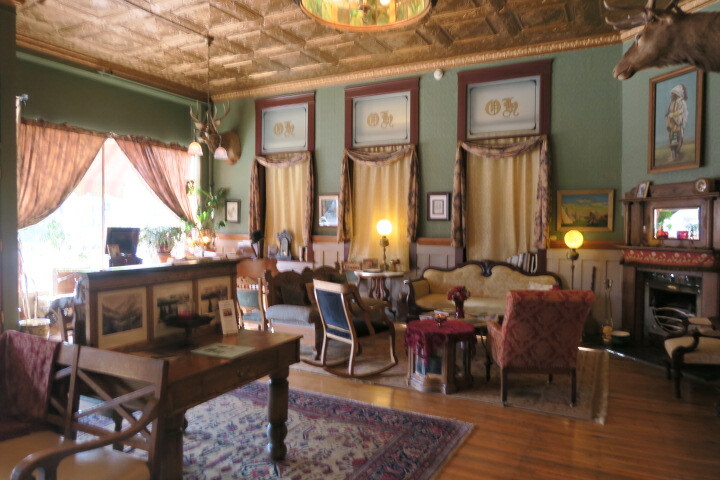 This is a beautiful, old hotel that was built in the nineteenth century, had started on a downward path in the 1930’s, and was in danger of being torn down when the owners purchased it in the mid 1990’s. It appears that little has been done to this hotel since it was originally built. New owners have been working at restoring it but it retains its old, crooked, painted, wood floors and original rattling doors. There was no mistaking that this is a historic building and if you like your hotel rooms shiny and new this wouldn’t be the place for you. It is pretty rough around the edges. I like it. We had reserved the “Madame’s Suite” but are offered a larger room, the “Prairie Cowboy” for the same rate. I am apprehensive about switching rooms knowing that I had researched and chose the Madame’s Suite for a reason. I don’t remember anything about the Prairie Cowboy. 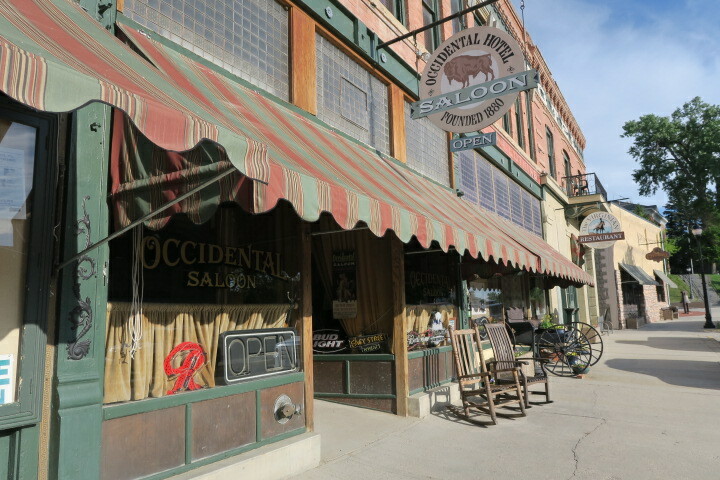 But the clerk insists that the Prairie Cowboy is a larger and nicer room and more conveniently located. I accept the switch. 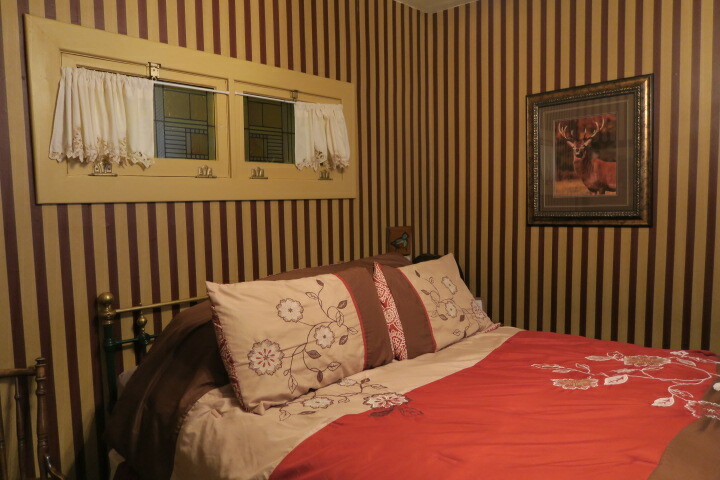 The Prairie Cowboy may be larger but it is not a “large” room either having maybe 3 or 4 feet on each side of the bed. The bed is comfortable, but our bathroom is nothing more than a clawfoot tub, toilet, and sink at the end of our room. 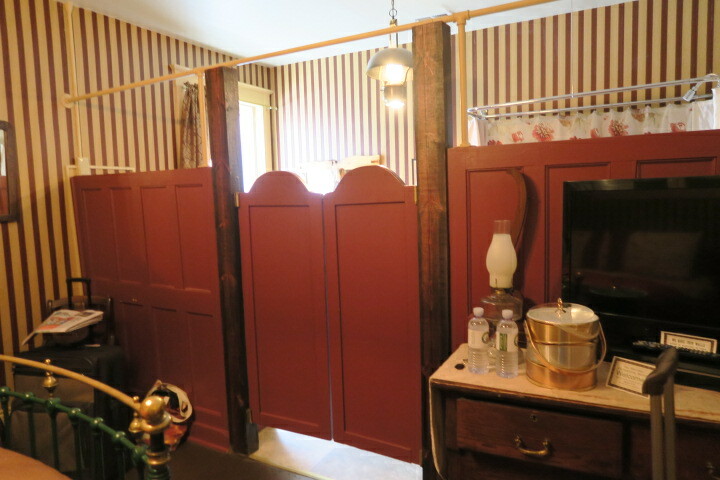 A half wall with a pair of swinging saloon doors separate the two spaces. It is not really a private area and it’s a good thing we’ve been married for so long. We plan to eat in the bar but the tables are mostly filled so we step into “The Virginian,” the hotel’s fine dining restaurant. We are the only guests and we have a pretty window seat. I order Chicken Dijon with green beans and rice. Doc orders Chicken Marsala. The meals have the potential to be quite fabulous and they are indeed pretty tasty except that my meal has way too much salt and Doc’s has too much pepper. Back in our room, Doc is anxious to watch the next NBA playoff game on television but, while we do have a television with a few channels, it’s a very basic satellite TV service and we don’t have any of the major networks including ABC. What we do have is a bad Wifi connection. I manage to get the game to play on my laptop but we have to continuously reload it time after time throughout the evening. I try to do some sketching but the only chair in the room is a hard wooden chair in the corner. Sitting on the bed to sketch is uncomfortable. I decide to read instead. The room gets warmer and warmer. We realize that the hotel does have the air conditioning advertised on their website, but it is central air conditioning and we have no control over our environment. We take the blankets off as we prepare for bed. Then Doc turns out the light. Our room continues to glow. There is a long, horizontal stained glass window over our bed with a bright hall light shining through. Doc gets up and closes the little café curtains. “Get some towels from the bathroom,” I suggest. He tries to drape towels over the curtain rods but they are too heavy and won’t stay hanging. “If we had a hammer and some nails we could hang up the blanket,” he says, annoyed and only half joking. I get some large safety pins that are a permanent part of my travel bag stash and we are able to pin the towels to the curtain rods blocking out most of the light. It’s still too warm in the room but I fall asleep anyway. Two hours later the heat wakes me up. I open my eyes and the first thing I see is the silhouette of five fan blades against the white ceiling. Holy cow. How did we not notice that? I get up and try to turn on the ceiling fan but it’s tied into the light switch. I have to turn on all of the lights to make the fan work and then turn off each light by its individual switch. Doc isn’t sleeping anyway. Happy to have a bit of the breeze, we both get a few more restless hours of sleep before crawling out of bed sometime around 5 AM.